In the car scene from the classic 1978 stoner comedy “Up In Smoke,” Tommy Chong explains to Cheech Marin that his dog ate his marijuana stash. As a teenager, you probably snickered at the thought of a pot-addled labrador, but the truth is, the fictional dog wouldn’t have been high at all. That’s because the psychoactive chemicals in cannabis can’t interact with your nervous system until they’re broken down by heating– a process known as decarboxylation. Why do you have to decarboxylize weed? Delta-9 Tetrahydrocannabinol (THC) is the most potent psychoactive chemical in marijuana, but the plant doesn’t make the chemical in that form. In raw pot flowers, the THC — along with the other cannabinoids in the plant — occurs in acid form, or THCa. The chemical structure that makes THCa acidic is a group of carbon and oxygen molecules, or a “carboxyl” group. This gives THCa a pH value less than 7, meaning it can accept an electron or donate a proton in chemical reactions with other substances — this is why acids tend to be corrosive. 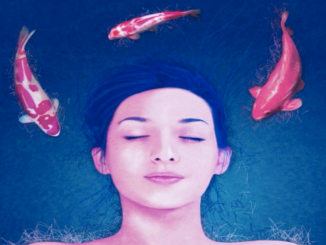 THC in its acidic form doesn’t react in the same way with the body’s endocannabinoid system, the system of neurotransmitter chemicals and nerve receptors that governs mood, appetite, memory and regulates a host of crucial physiological functions. THC, cannabidiol (CBD) and the other cannabinoids in the plant fit into nerve receptors like keys in locks, partially mimicking the body’s own naturally occurring cannabinoids. The chemicals in pot hijack the body’s endocannabinoid system, which is responsible for the marijuana high and most of the therapeutic effects of cannabis. 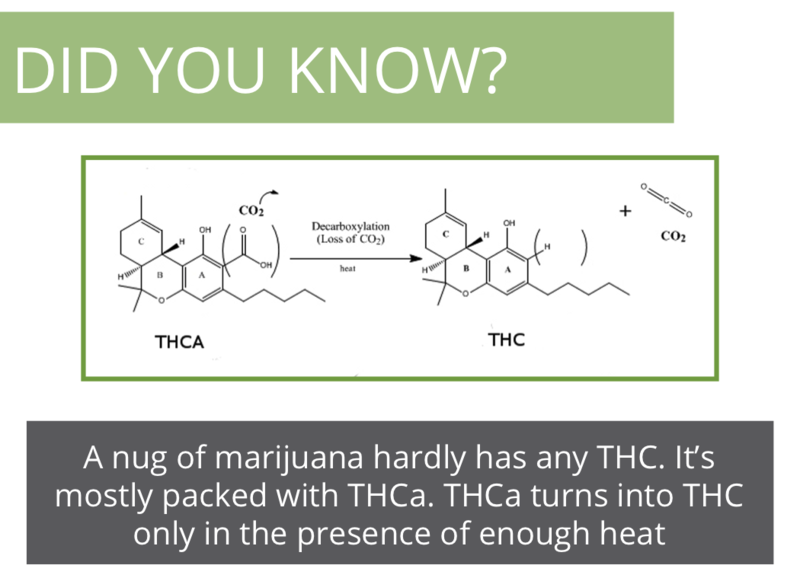 THCa doesn’t fit in those receptors, or at least, not in the same way as THC. In other words, THCA isn’t “bioavailable” when you ingest it; your body can’t use it or break it down in the same way as THC. That’s why if you eat a nug of cannabis, juice its leaves, or make tea from the roots, you don’t feel high. In other words, you won’t have a “psychoactive” experience. The same concept applies to CBDa, so you won’t be able to reap the incredible medical benefits of CBD unless you apply heat first. To make THCA into Delta-9 tetrahydrocannabinol, you have to get rid of the carboxyl group which makes it an acid through decarboxylation. The application of heat causes the carboxyl group to release from THC in the form of carbon dioxide. When you smoke or vaporize marijuana, the heat of the flame or vaporizer filament takes care of this process without you having to think about it. 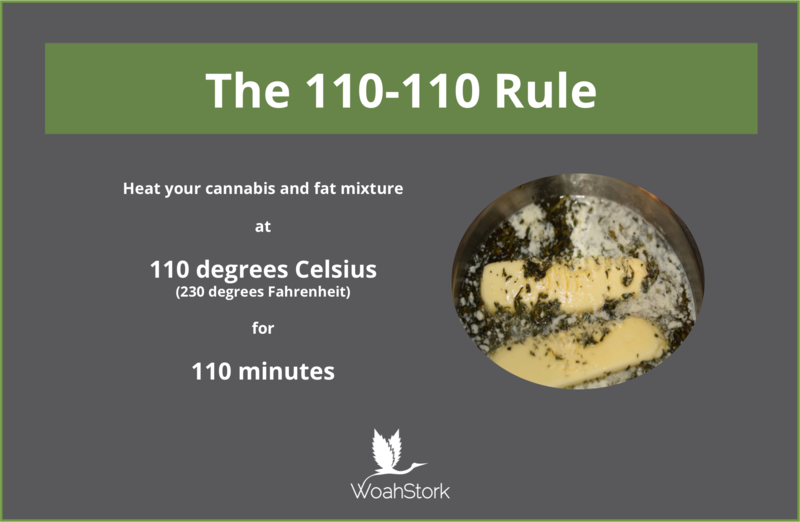 But if you’re making cannabis edibles, you need to take steps to make sure you get the maximum available THC from the plant. How do you decarboxylize weed? Decarboxylation of cannabis is integral to the smoking experience: applying heat to your marijuana is the quickest and easiest way to turn the THCa into that coveted THC. This can be done by lighting a joint, blunt, bong, or bowl or by vaporizing cannabis concentrates or raw flower. Scientists have experimented with and even patented different ways to initiate carboxylation by using catalysts and water solutions, but the easiest way — especially if you’re making pot edibles — is to immerse the whole flowers/buds of the plant in a lipid (fat) solution. Then, you apply a low, steady heat. You can use simple glycerine to do this, but you probably want to use butter or coconut oil if you’re baking cannabis treats. Looking for a way to make cannabis oil? Follow our easy recipe. The solution needs to be some kind of fat because THC and other cannabinoids are fat-soluble, meaning they dissolve in lipids and not in water. So the heat breaks off the carboxyl group, allowing the THC molecules to leach into the fat as a solute. Low and slow, in other words, is the best way to decarboxylate marijuana. Too much heat can cause the cannabinoids to break down too far. THC, for instance, breaks down into cannabinol, a much less potent cannabinoid. Is There A Benefit To Cannabis Without Decarboxylation? Consuming raw cannabis has been reported to have a slew of medical benefits. Juicing cannabis leaves and stalks has anti-inflammatory, anti-oxidant effects and neuroprotective properties by working on the TNF-alpha system. Since THCa is more water soluble than THC, there are a great deal of tinctures and patches available on WoahStork’s online cannabis marketplace — great for maximizing THCa absorption. THCa has also been shown to have strong anti-nausea effects by way of its potential to affect CB1 receptors. THCa can also affect the dopaminergic system, helping to prevent cell death. This is critical for people with Parkinson’s Disease, which is hallmarked by the deterioration of dopamine neurons. THCa has also been shown, anecdotally, to help with lupus. Since the THCa hasn’t metabolized into THC, people can consume much more cannabis– upwards of 600mg in a serving. See our article on THCa for more insights.